By Alexis Leon & Richard Brooks, Comdex Computer Publishing, 1997. This book is written with an aim to give you an in-depth understanding of PowerBuilder 4 and application development using it in a client-server environment You will quickly learn to design, build and deploy applications using PowerBuilder 4. The book gives a comprehensive treatment of PowerBuilder 4 and teaches you how to develop applications in it using a step by step approach. You will find chapters on the history of PowerBuilder, and techniques from PowerBuilder gurus like Richard Brooks, Breck Carter, Sheldon Tanner, Ken M. Howe, Jesse S. Herrera Jr.. Chuck Wood, etc. The book also contains the much acclaimed 'PowerBuilder Labs' by Dr. Randal Vaughn and the PowerBuilder FAQ by Craig Wagner. 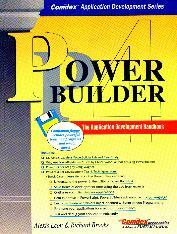 The book also gives an extensive list of PowerBuilder resources on the Internet. The companion floppy contains a host of utilities, objects, etc. which could be readily used. This book is for all users of PowerBuilder.